Yao Jui-Chung, Incarnation – Holy Light Sculpture Factory, Yangmei Dist., Taoyuan City, 2016–17. Fiber-based gelatin silver print, 18.5 x 23.5 cm. Courtesy of the artist and TKG+. First conceived in early 2016, Yao Jui-chung’s “Incarnation” series covers more than 230 temples, cemeteries, public gardens, and amusement parks, photographed within one and a half years, featuring the statues of deities created by the Han people by reference to their self-images. Some of these statues are toppled, while others remain standing. Carefully observing these statues, one may further grasp the endemic political relations in different geographical spaces. The artist intentionally leaves out people in each frame, shunning religious gatherings or festivities, and focuses instead on the physical embodiment of the gods—a projection of devotees’ fervent desire. This body of work explores the manifestation of human wants in a clinical approach that eschews religious architecture, folk activities, or worship ceremonies. In a dispassionate, monotone palette, the new photography series scrutinizes the inextricable connections between man, religion, and faith. The total of more than 12,000 temples in Taiwan help shape the sui generis temple culture that has become the most enigmatic and eventful dimension of the Greater Chinese world. Most temples serve to address ordinary people’s earthly needs, and offer them spiritual sustenance. What inspires the followers’ devotion is not their genuine faith in the deities, but the extent as to how efficacious the deities are in producing miracles. And the statues of deities that are larger than life size may well encourage the followers’ devotional practices. Yao Jui-chung captures the absurdity of deity statues against the urban backdrop, distilling a sense of beauty in the monotone palette of the 300 images that document the sensualist society. In addition to the array of 300 gelatin silver prints, a three-channel video installation of Incarnation is also on view, where the rising and falling tones of the complex radio spectrum of Saturn recorded by NASA transport the viewer to the mystical universe. Deities of all stripes on the three screens instantiate the intertwining relationship between history and society. Evoking a road movie, the video installation repaints the landscape of Taiwan suffused with a magical divinity interspersed with sentient yearnings. There is also a performance on the opening day by sound artist Dawang Yingfan Huang and musician Meuko! Meuko!, who is known in Japan and Taiwan for her experimental approach to electronic music. Conceived as a modern version of religious tribute to the gods, the collaboration reassembles the visual and sound elements of a traditional temple fair and conjures an organic performance that manifests Taiwanese cultural and religious beliefs. Born in Taipei in 1969, Yao Jui-chung has exhibited extensively, including at the Sydney Biennale (2016), Venice Architecture Biennale (2014), Asia Triennial Manchester (2014), Asia Pacific Triennial (2009), Yokohama Triennale (2005), and Venice Biennale (Taiwan Pavilion, 1997). The artist is engaged in a diverse range of mediums such as painting, installation, and photography, while photography remains his main artistic language. His seminal work includes the “Action Series” (1994–2002), which examines Taiwanese subjectivity, postcolonialism, and Chinese modern history and politics; “Phantom of History Series” (2007), which mocks authoritarianism; as well as Long Live (2011) and Long Long Live (2013), which ponder the lasting influences of the White Terror and Martial Law period. In 2005 the artist compiled a series of images he took over a decade around Taiwan that coalesce into a grand picture of Taiwanese ideology shaped by globalization and the island’s unique history. 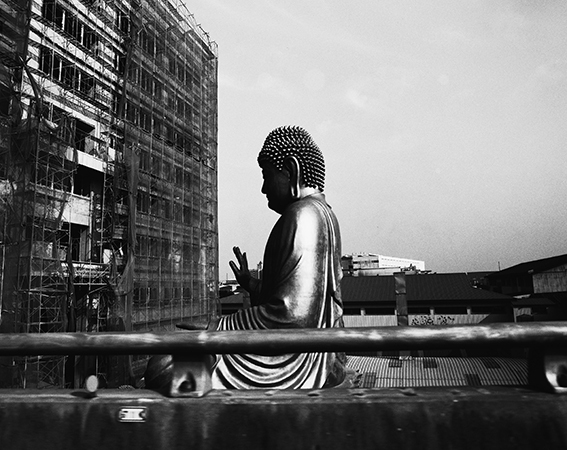 This led to Mirage: Disused Public Property in Taiwan (2010–16), a project that galvanized public opinion and indirectly provoked government action by documenting in black-and-white photography the infamous “mosquito houses,” or extravagant public spaces supported by government funding that have been left idle. For additional information and images, please visit www.tkgplus.com or contact info [​at​] tkgplus.com.